Tonto Dikeh’s marital crisis has just entered a whole new level. Following her tell-all interview a few days ago where she opened up on how her hubby, Oladuni Churchill maltreats, beats and cheats on her, a new video (rather confusing though) has just hit the internet with shocking details about her. In the new video published online by Asempa News in Ghana, a man identified as Supt. Joseph Oppong, Crime Officer at the Madina Divisional Police is seen reading a statement allegedly written by Churchill during one of their fights in Ghana. 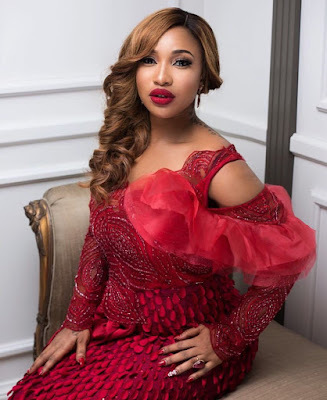 Reading from the statement with, Oppong said they received a call to Churchill’s Trasaaco estate in Ghana where they went in to find Tonto Dikeh in a rage, destroying items in the house because she claimed her husband was cheating on her. READ Moronfayo Olaniyi Seven-Seven, Reason Behind My Support For Esabod And Her Bullying Team. Oppong said before they arrived, she had destroyed $15,000 worth of items and they had to restrain her adding that she had even waved a gun at one of Churchill’s bodyguards who tried to stop her from breaking the properties.